For the 2016 film biographical film, see Florence Foster Jenkins (film). Florence Foster Jenkins (born Narcissa Florence Foster; July 19, 1868 – November 26, 1944) was an American socialite and amateur soprano who was known and mocked for her flamboyant performance costumes and notably poor singing ability. The historian Stephen Pile ranked her "the world's worst opera singer ... No one, before or since, has succeeded in liberating themselves quite so completely from the shackles of musical notation." Despite (or perhaps because of) her technical incompetence, she became a prominent musical cult figure in New York City during the 1920s, 1930s, and 1940s. Cole Porter, Gian Carlo Menotti, Lily Pons, Sir Thomas Beecham, and other celebrities were fans. Enrico Caruso is said to have "regarded her with affection and respect". The poet William Meredith wrote that what Jenkins provided "was never exactly an aesthetic experience, or only to the degree that an early Christian among the lions provided aesthetic experience; it was chiefly immolatory, and Madame Jenkins was always eaten, in the end." Narcissa Florence Foster was born July 19, 1868, in Wilkes-Barre, Pennsylvania, the daughter of Charles Dorrance Foster (1836–1909), an attorney and scion of a wealthy land-owning Pennsylvania family, and Mary Jane Hoagland Foster (1851–1930). Her one sibling, a younger sister named Lillian, died at the age of eight in 1883 of diphtheria. Foster said her lifelong passion for public performance began when she was seven years old. A talented pianist, she performed at society functions as "Little Miss Foster", and gave a recital at the White House during the administration of President Rutherford B. Hayes. After graduating from high school, she wanted to study music in Europe, but after her father refused she eloped with Frank Thornton Jenkins (1852–1917) to Philadelphia, where they married in 1885. The following year, after learning that she had contracted syphilis from Frank, she ended their relationship and reportedly never spoke of him again. Years later, Florence asserted that a divorce decree had been granted on March 24, 1902, although no documentation of this has been found. She retained the Jenkins surname for the remainder of her life. After an arm injury ended her aspirations as a pianist, Jenkins gave piano lessons in Philadelphia to support herself; but around 1900 she moved with her mother to New York City. In 1909, she met British Shakespearean actor St. Clair Bayfield, and they began a vaguely defined cohabitation relationship that continued the rest of her life. Upon her father's death later that year, Jenkins became the beneficiary of a sizable trust, and resolved to resume her musical career as a singer, with Bayfield as her manager. She began taking voice lessons and immersed herself in wealthy New York City society, joining dozens of social clubs. As the "chairman of music" for many of these organizations, she began producing lavish tableaux vivants—popular diversions in upper-crust social circles of that era. In each of these productions, Jenkins would invariably cast herself as the main character in the final tableau, wearing an elaborate costume of her own design. In a widely republished photograph, Jenkins poses in a costume, complete with angelic wings, from her tableau inspired by Howard Chandler Christy's painting Stephen Foster and the Angel of Inspiration. Jenkins began giving private vocal recitals in 1912, when she was in her early forties. In 1917, she became founder and "President Soprano Hostess" of her own social organization, the Verdi Club, dedicated to "fostering a love and patronage of Grand Opera in English". Its membership quickly swelled to over 400; honorary members included Enrico Caruso. When Jenkins's mother died in 1930, additional financial resources became available for the expansion and promotion of her singing career. According to published reviews and other contemporary accounts, Jenkins's acknowledged proficiency at the piano did not translate well to her singing. She is described as having great difficulty with such basic vocal skills as pitch, rhythm, and sustaining notes and phrases. In recordings, her accompanist Cosmé McMoon can be heard making adjustments to compensate for her constant tempo variations and rhythmic mistakes, but there was little he could do to conceal her inaccurate intonation. She was consistently flat, sometimes considerably so. Her diction was similarly substandard, particularly with foreign-language lyrics. The difficult operatic solos that she chose to perform—all well beyond her technical ability and vocal range—served only to emphasize these deficiencies. "There's no way to even pedagogically discuss it," said vocal instructor Bill Schuman. "It's amazing that she's even attempting to sing that music." The opera impresario Ira Siff, who dubbed her "the anti-Callas", said, "Jenkins was exquisitely bad, so bad that it added up to quite a good evening of theater ... She would stray from the original music, and do insightful and instinctual things with her voice, but in a terribly distorted way. There was no end to the horribleness ... They say Cole Porter had to bang his cane into his foot in order not to laugh out loud when she sang. She was that bad." Nevertheless, Porter rarely missed a recital. The question of whether "Lady Florence"—as she liked to be called, and often signed her autographs—was in on the joke, or honestly believed she had vocal talent, remains a matter of debate. On the one hand, she compared herself favorably to the renowned sopranos Frieda Hempel and Luisa Tetrazzini, and seemed oblivious to the abundant audience laughter during her performances. Her loyal friends endeavored to disguise the laughter with cheers and applause; and they often described her technique to curious inquirers in "intentionally ambiguous" terms—for example, "her singing at its finest suggests the untrammeled swoop of some great bird". Favorable articles and bland reviews, published in specialty music publications such as The Musical Courier, were most likely written by her friends, or herself. "I would say that she maybe didn't know [how badly she sang]," said mezzo-soprano Marilyn Horne. "We can't hear ourselves as others hear us." Nerve damage due to syphilis and its treatment (see below) may have physically compromised her hearing as well. On the other hand, Jenkins refused to open her performances to the general public, and was clearly aware of her detractors. "People may say I can't sing," she once remarked to a friend, "but no one can ever say I didn't sing." She dismissed her original accompanist, Edwin McArthur, after catching him giving her audience "a knowing smile" during a performance. She went to great lengths to control access to her rare recitals, which took place at her apartment, in small clubs, and once each October in the Grand Ballroom of the Ritz-Carlton Hotel. Attendance, by personal invitation only, was restricted to her loyal clubwomen and a select few others. Jenkins handled distribution of the coveted tickets herself, carefully excluding strangers, particularly music critics. "There's no way she could not have known," said Schuman. "No one is that unaware ... she loved the audience reaction and she loved singing. But she knew." Despite her careful efforts to insulate her singing from public exposure, a preponderance of contemporaneous opinion favored the view that Jenkins's self-delusion was genuine. "At that time Frank Sinatra had started to sing, and the teenagers used to faint during his notes and scream," McMoon told an interviewer. "So she thought she was producing the same kind of an effect." "Florence didn't think she was pulling anyone's leg," said opera historian Albert Innaurato. "She was compos mentis, not a lunatic. She was a very proper, complex individual." Her recitals featured arias from the standard operatic repertoire by Mozart, Verdi, and Johann Strauss; lieder by Brahms; Valverde's Spanish waltz "Clavelitos" ("Little Carnations"); and songs composed by herself and McMoon. As in her tableaux, she complemented her performances with elaborate costumes of her own design, often involving wings, tinsel, and flowers. She would perform "Clavelitos" dressed as Carmen, complete with castanets and a wicker basket of flowers, clicking the castanets and tossing the flowers one by one. When she ran out of flowers, she flung the basket too—and then the castanets. Her fans, aware that "Clavelitos" was her favorite song, would usually demand an encore, prompting her to send McMoon into the audience to retrieve flowers, basket, and castanets so that she could sing the number again. Once, when a taxi in which she was riding collided with another car, Jenkins let out a high-pitched scream. Upon arriving home, she went immediately to her piano and confirmed (at least to herself) that the note she had screamed was the fabled "F above high C"—a pitch she had never before been able to reach. Overjoyed, she refused to press charges against either involved party, and even sent the taxi driver a box of expensive cigars. McMoon said neither he "nor anyone else" ever heard her actually sing a high F, however. At the age of 76, Jenkins finally yielded to public demand and booked Carnegie Hall for a general-admission performance on October 25, 1944. Tickets for the event sold out weeks in advance; the demand was such that an estimated 2,000 people were turned away at the door. Numerous celebrities attended, including Porter, Marge Champion, Gian Carlo Menotti, Kitty Carlisle and Lily Pons with her husband, Andre Kostelanetz, who composed a song for the recital. McMoon later recalled an "especially noteworthy" moment: "[When she sang] 'If my silhouette does not convince you yet/My figure surely will' [from Adele's aria in Die Fledermaus], she put her hands righteously to her hips and went into a circular dance that was the most ludicrous thing I have ever seen. And created a pandemonium in the place. One famous actress had to be carried out of her box because she became so hysterical." Since ticket distribution was out of Jenkins's control for the first time, mockers, scoffers, and critics could no longer be kept at bay. The following morning's newspapers were filled with scathing, sarcastic reviews that devastated Jenkins, according to Bayfield. "[Mrs. Jenkins] has a great voice," wrote the New York Sun critic. "In fact, she can sing everything except notes ... Much of her singing was hopelessly lacking in a semblance of pitch, but the further a note was from its proper elevation the more the audience laughed and applauded." The New York Post was even less charitable: "Lady Florence ... indulged last night in one of the weirdest mass jokes New York has ever seen." Five days after the concert, Jenkins suffered a heart attack while shopping at G. Schirmer's music store, and died a month later on November 26, 1944, at her Manhattan residence, the Hotel Seymour. She was buried next to her father in the Foster mausoleum, Hollenback Cemetery, Wilkes-Barre, Pennsylvania. Some of Jenkins's performance difficulties have been attributed to untreated syphilis, which causes progressive deterioration of the central nervous system in its later stages. Nerve damage and other morbidities caused by the disease may have been compounded by toxic side effects—such as hearing loss—from mercury and arsenic, the prevailing (and largely ineffective) syphilis remedies of the pre-antibiotic era. By the time penicillin became generally available in the 1940s, Jenkins' disease had progressed to the tertiary stage, which is unresponsive to antibiotics. The only professional audio recordings of Jenkins consist of nine selections on five 78-rpm records (Melotone Recording Studio, New York City, 1941–1944), produced by Jenkins herself, at her own expense. These include four coloratura arias from operas by Mozart, Delibes, Johann Strauss II, and Félicien David, and five art songs, two written for Jenkins by her accompanist, Cosmé McMoon. Seven of the selections were released by RCA Victor on a 10-inch LP in 1954, and reissued on a 12-inch LP in 1962, The Glory (????) of the Human Voice. The Glory (????) of the Human Voice (Sony Classical, OCLC 968787814, 1992) is a reissue of the 1962 Victor recording with the song "Serenata mexicana" by McMoon added. Florence Foster Jenkins & Friends: Murder on the High Cs (Naxos Records, OCLC 873003955, 2003) contains nine selections, adding "Valse Caressante" by McMoon. 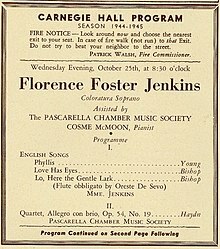 The Muse Surmounted: Florence Foster Jenkins and Eleven of Her Rivals (Homophone Records, OCLC 58399998, 2004) includes one Jenkins song, "Valse Caressante", plus a brief interview with McMoon. Jenkins commissioned filming of her performances at the Verdi Club's signature annual event, the "Ball of the Silver Skylarks", held each October at the Ritz Carlton Hotel. These films were thought lost until those for 1934 through 1939 and 1941 were discovered in 2009. Jenkins historian Donald Collup has announced plans to feature excerpts from her filmed performances in an upcoming documentary. Precious Few, a play about Jenkins and the English novelist Ronald Firbank by Terry Sneed, premiered in 1994 at Wildwood Park for the Performing Arts in Little Rock, Arkansas. Goddess of Song, a one-woman play by South African playwright Charles J. Fourie and performed by Carolyn Lewis, was staged in 1999 at the Coffee Lounge in Cape Town, South Africa. Viva La Diva by Chris Ballance had a run in 2001 at the Edinburgh Fringe. Souvenir: a Fantasia on Florence Foster Jenkins by Stephen Temperley opened off-Broadway at the York Theatre in 2004 with Jack Lee as Cosme McMoon and Judy Kaye as Mrs Jenkins. After an interim engagement at the Berkshire Theater Festival it opened on Broadway at the Lyceum Theater in 2005, directed by Vivian Matalon with Donald Corren as Cosme McMoon and Judy Kaye as Jenkins. Kaye summarized the difficulties of her role: "It's hard work to sing badly well. You could sing badly badly for a while, but you'll hurt yourself if you do it for long." Glorious! by Peter Quilter opened in 2005 in London's West End with Maureen Lipman starring as Jenkins. It was nominated for an Olivier Award as Best New Comedy, and has since been performed in more than 40 countries in 27 languages. "Florence Foster Jenkins", a track on the 2009 self-titled album by the indie folk band Everyday Visuals, is "a salute to artists who stubbornly strive against long odds". Jenkins was the subject of the "Not My Job" segment of NPR's radio program Wait Wait... Don't Tell Me! on October 25, 2009. NBC news anchor Brian Williams, the show's special guest, was asked a series of trivia questions about Jenkins, whom he nicknamed "Flo Fo". The broadcast took place in Carnegie Hall on the 65th anniversary of her performance there. The biographical documentary Florence Foster Jenkins: A World Of Her Own was released in 2007. Anne McCaffrey's 1994 short piece "Euterpe on a Fling" is a fictional interview with Jenkins that drew from facts known about her life and career. The 2015 French feature film Marguerite was loosely inspired by Jenkins's life and career. Florence Foster Jenkins, a British bio-pic starring Meryl Streep in the title role, was directed by Stephen Frears and premiered in London on April 12, 2016, and in New York on August 12, 2016. Streep was nominated for the Academy Award for Best Actress among other awards for her portrayal of Jenkins. ^ Pile, Stephen (2011). The Ultimate Book of Heroic Failures. Faber and Faber. p. 115. ISBN 978-0-571-27728-5. ^ a b Florence Foster Jenkins at American National Biography Online, retrieved October 18, 2016. ^ "Celebrity fan club: the stars who loved the world's worst singer", The Daily Telegraph, retrieved September 20, 2016. ^ Florence Foster Jenkins at maxbass.com, retrieved November 21, 2016. ^ a b c d e f The Worst Singer in the World. psmag.com, retrieved August 11, 2016. ^ a b "Music. Dreamer". Time. November 19, 1934. Retrieved 2016-08-15. ^ Skrapits, Elizabeth, "Opera singer's family owned land" Citizens' Voice, December 24, 2014, retrieved March 28, 2015. ^ Foster biography at anb.org, accessed March 28, 2015. ^ Oxford Reference: Jenkins, Florence Foster (née Foster, Nascina Florence) accessed January 30, 2016. ^ a b c d Otto, Julie Helen. "Ancestry of Florence Foster Jenkins". William Addams Reitwiesner Genealogical Services. ^ Lowry, Mark (10 August 2016). "Fort Worth man's film inspired Streep's Florence Foster Jenkins". Fort Worth Star-Telegram. Retrieved 6 August 2016. ^ a b c MacIntyre, F. Gwynplaine (June 23, 2004). "Happy in her work". Daily News. New York City. Archived from the original on August 10, 2004. Retrieved December 23, 2008. ^ "Florence Foster Jenkins: An Appreciation". Loyola University New Orleans Special Collections and Archives Online. Melotone Recording Studio. 1946. Retrieved 2018-07-16. ^ a b "Mrs. Florence F. Jenkins. Founder of Verdi Club. Gave Recital Here on Oct. 25". The New York Times. November 27, 1944. ^ Foster family tree, wargs.com; accessed March 28, 2015. ^ Piano ma non solo, Jean-Pierre Thiollet, Anagramme Ed., 2012, pp. 140–41; ISBN 978 2 35035 333 3. ^ a b c d Huizenga, T. Killing Me Sharply With Her Song: The Improbable Story Of Florence Foster Jenkins. NPR.org (August 10, 2016), retrieved October 25, 2016. ^ a b c Getlen, Larry, "How the world’s worst singer made a career as a musician", New York Post, July 30, 2016, retrieved August 15, 2016. ^ a b c d Queen of the Night. NPR.org (August 1, 2014), retrieved August 15, 2016. ^ Felton, Bruce (1980) "That's Entertainment? 6 Perfectly Wretched Performers", pp. 162–63, in The Book of Lists #2, edited by Irving Wallace, et al., London: Elm Tree Books, ISBN 0241104335. ^ Martin & Rees (2016), p. 38. ^ Martin & Rees (2016), p. 44. ^ a b Jeremy Nicholas, "Review: Florence Foster Jenkins – (A) World of Her Own", Gramophone. ^ Martin & Rees (2016), p. 28. ^ Collup, Donald. "Orchids, Tiaras, Minks, Ermines and Top Hats: My recent revelations about Florence Foster Jenkins". collup.com. Retrieved October 30, 2016. ^ Collup, Donald (January 2016). "Discovering a Survival". collup.com. Retrieved October 30, 2016. ^ Elysa Gardner (November 10, 2005). "'Souvenir' squeals with diva delight". USA Today. Retrieved January 28, 2010. ^ Green, Jesse (2004), "Singing Badly Well", The New York Times, December 5, 2004, p. AR6. ^ Quilter, Peter (2005). Glorious. London and New York: Bloomsbury Methuen Press. ISBN 978-0413775405. ^ "Maureen Lipman on soprano Florence Foster Jenkins". The Guardian. London. November 3, 2005. Retrieved January 23, 2011. ^ Charles Spencer (November 4, 2005). "The triumph of a comforting illusion". The Daily Telegraph. London. Retrieved January 28, 2010. ^ Jonathan Perry (May 12, 2009). "Visuals: from high notes to heavy subjects". The Boston Globe. Retrieved January 28, 2010. ^ "NBC News Anchor Brian Williams Plays 'Not My Job'". NPR. October 24, 2009. Retrieved January 28, 2010. ^ McCaffrey, Anne (May 1994). The Girl Who Heard Dragons. Tor Books. pp. 78–89. ISBN 978-0312931735. Retrieved 29 October 2017. I carefully unfolded the two yellowed and now fragile clippings attached to my scrawled sheets, and suddenly it was as if I were back in that dark corner of the gloomy old Seymour Lounge, where Madame Jenkins had agreed to meet me. ^ "Florence Foster Jenkins London premiere April 12". simplystreep.com. Retrieved August 25, 2016. ^ "London premiere of Florence Foster Jenkins". starwatchbyline.com. Retrieved August 25, 2016. ^ Evans, Suzy, "'Florence Foster Jenkins' Screenwriter, Co-Stars Praise Meryl Streep's Dedication, Commitment", Hollywood Reporter, August 10, 2016, retrieved September 19, 2016. 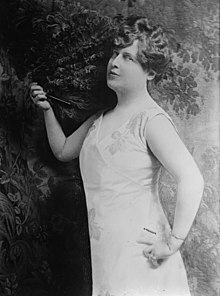 Wikimedia Commons has media related to Florence Foster Jenkins. Bullock, Darryl W. (2016). Florence! Foster!! Jenkins!!! : The Life of the World's Worst Opera Singer. The Overlook Press. ISBN 9781468314090.